نشان: "انصاف، آزادي ۽ خوشحالي"
ڏکڻ سوڊان(انگريزي: South Sudan) i/suːˈdæn/  سرڪاري نالو ريپبلڪ آف سائوٿ سوڊان  اوڀر وچ آفريڪا جو خشڪيءَ سان گھيريل ملڪ آهي. ھن ملڪ پنھنجي آزادي ريپبلڪ آف سوڊان کان 2011 ۾ حاصل ڪئي. ملڪ جو گاديءَ جو هنڌ جبا آھي.ھن ملڪ جون سرحدون اتر ۾ سوڊان، اوڀر ۾ ايٿوپيا، ڏکڻ اوڀر ۾ ڪينيا ، ڏکڻ ۾ يوگنڊا، ڏکڻ اولھ ۾ ڊيموڪريٽڪ ريپبلڪ آف ڪانگو ۽ اولھ ۾ سينٽرل آفريڪن ريپبلڪ سان ملن ٿيون. ↑ "The Transitional Constitution of the Republic of South Sudan, 2011". Government of South Sudan. وقت 21 July 2011 تي اصل کان آرڪائيو ٿيل. حاصل ڪيل 12 July 2011. Part One, 6(2). "English shall be the official working language in the Republic of South Sudan". ↑ "At a Glance". Official portal. Government of Southern Sudan. وقت 28 June 2011 تي اصل کان آرڪائيو ٿيل. حاصل ڪيل 24 July 2011. ↑ "The Transitional Constitution of the Republic of South Sudan, 2011" (PDF). Government of South Sudan. حاصل ڪيل 18 November 2016. ↑ Manfredi, Stefano (2013). "Juba Arabic (ÁRABI JÚBA): A "less indigenous language" of South Sudan". Forthcoming in Sociolinguistic Studies, 12 (1). https://www.academia.edu/35055738. Retrieved 9 September 2018. ↑ ايٿنولاگ: Ethnologue Languages of the World – South Sudan, Retrieved 9 September 2018. 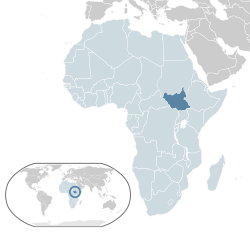 ↑ "S. Sudanese government agrees to federal system with rebels – Sudan Tribune: Plural news and views on Sudan" (en ۾). Sudan Tribune (Addis Ababa). 27 September 2014. http://www.sudantribune.com/spip.php?article52556. ↑ "Discontent over Sudan census". News24.com. AFP. 21 May 2009. http://www.news24.com/World/News/Discontent-over-Sudan-census-20090521. Retrieved 14 July 2011. ↑ 12.0 12.1 12.2 12.3 "South Sudan". World Economic Outlook Database. International Monetary Fund. ↑ "Gini Index". World Bank. حاصل ڪيل 2 March 2011. ↑ ".ss Domain Delegation Data". Internet Assigned Numbers Authority. ICANN. حاصل ڪيل 1 September 2011. ↑ "South Sudan". The World Factbook. CIA. حاصل ڪيل 14 July 2011. ↑ "UN classification of world regions Eastern Africa: South Sudan". UN. حاصل ڪيل 25 September 2011. ↑ "Broadcast of Declaration of Independence (part 1)". Youtube.com. حاصل ڪيل 2 May 2013. ↑ "Broadcast of Declaration of Independence (part 2)". Youtube.com. حاصل ڪيل 2 May 2013. هيءُ صفحو آخري ڀيرو 22:15، 30 آڪٽوبر 2018ع تي ترميميو ويو هو.